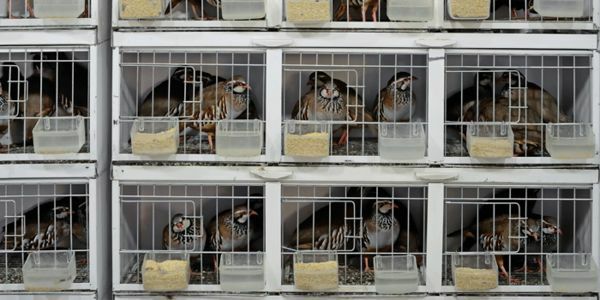 Sign to stop game birds from being tortured alive in the UK! Not only are they bred to be shot and eaten, but game birds in the UK are often being kept in conditions that would be illegal for chickens. At one farm holding 25,000 game birds, reporters found carcasses of dead pheasants, cannibalised, plucked or pecked to death by other "stressed out" birds and in crowded pens. Stacked in wire-mesh cages that crack their feet, many birds don't even reach the moment they are released in estates to be brutally killed. Stepped on, plucked alive by their cellmates, sometimes the sheer number of animals in each cage is so much they die of starvation and suffocation. Investigators found the stench of rotting flesh and droppings were unbearable. The Animal Welfare Act 2006 does not define game birds as livestock as they are bred for sporting purposes, rather than for food. As a result they are not subject to specific farm welfare legislation. - this has to stop! Demand DEFRA give game birds the same protections as chickens now! The Game Farmers Association say that all their members must follow the government's code of practice for rearing game birds which ought to ensure animals are given basic protection under the Animal Welfare Act 2006. However, even these basic codes are clearly not being followed by all. The Animal and Plant Health Agency (APHA) only carries out checks on animal welfare at farms if a member of the public makes a complaint. But many game farms are in very rural areas hidden from public view. Sign now to demand that APHA carry out routine animal welfare checks of all game farms without a need for a specific complaint. Join Care2 on the march for wildlife and let's #CrushCruelty - 12 August 2017 in London - Stand up against game farming, raptor persecution, badger culling, fox hunting, cubbing and grouse shooting. RSVP here.